Your child’s safety is important to us! 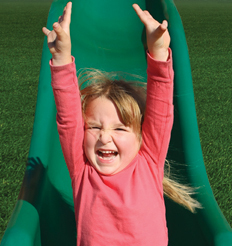 That’s why Gorilla Playsets™ is the industry leader when it comes to safety and innovation! We use only the safest hardware and lumber on our playsets. We also integrate unique features such as flat, wide ladder steps, smooth edges, strategically placed grab handles, and more! Each activity on our sets are thoroughly tested to ensure they’re free of conflicting play zones. All of our play systems, add-ons, and accessories are designed to voluntarily meet ASTM standards and specifications. This is just another way that Gorilla Playsets is looking out for the safety of your children. 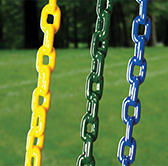 Our swing chains are covered in a soft plastic coating that helps keep the chains cool AND prevents pinches and pulled hair! This coating is durable and flexible and designed to provide peace of mind. It didn’t take us long to realize that we could sand the lumber at our factory twice to add extra peace of mind. 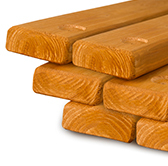 This way our lumber is beautiful, smooth, and ready to use right off the bat. We even pre-drill the main beams to help speed up the installation and eliminate possible mistakes. We use 5/16 ” diameter and 3/8” diameter electro-galvanized hardware on our play sets for maximum strength and stability. Our iron swing hangers are bolted completely through our swing beams with carriage bolts and lock nuts. Electro-galvanized wood screws are also used for non-structural components, instead of nails that can rust and/or work their way loose over time. 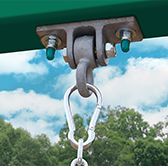 Our swing chains are tested to withstand up to 800 pounds, and most of the hardware components that you will receive are the same as industrial grade units. Our slides are simply the best available! Our wave slides feature a solid, single wave design, the widest landing bed and the highest sides, for maximum safety and enjoyment. We also have other slide designs, such as 360° enclosed spiral tube slides, and scoop slides that can fit a 7 ’ deck height. 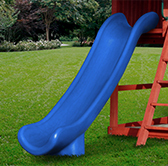 The slides are either one-piece injection molded or rotomolded, with UV inhibitors to prevent heating and fading in direct sunlight, and do not require any additional wood framing for support. Huge 4x6 swing beams are standard on all swing sets. 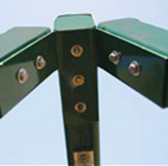 For our single swing beam units we use a one-piece heavy-gauge steel swing beam bracketing system with a rigid 4 x 6 swing beam and 4 x 4 swing legs.